Sometimes our weeks are crazy. I'm sure you can all relate. Between work, school, dance, karate, church activities, and well, just life, sometimes dinner is an after thought. I try to keep some of our go-to meals on hand for times like that. This meatball sub is one of our go to meals. I keep rolls and meatballs in the freezer and a jar of spaghetti sauce in the pantry. It's good to have meals like this on hand. It is super yummy, and you can make it in about 10 minutes. Place a few meatballs on a glass plate and cook in microwave for about 3 minutes, until defrosted. Place meatballs and enough spaghetti sauce in a pan on the stove and cook on medium for 53-6 minutes, just until everything is warmed through. Meanwhile, butter the inside of your roll and place butter side down on a skillet set to high just long enough to melt the butter and crisp the edges. 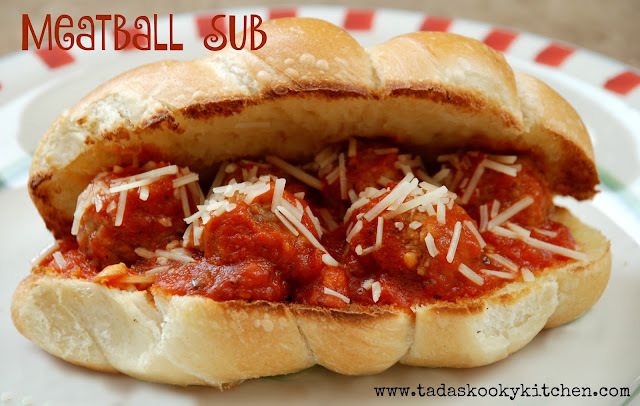 Put meatballs & sauce on your roll, top with Parmesan cheese. Enjoy!